Hello and welcome to my page of links. 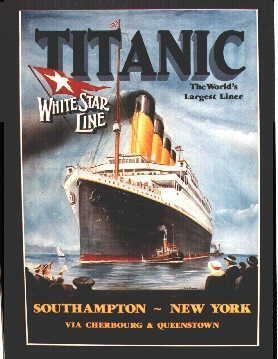 Stuart Williamson`s Original Titanic/Liner Prints. Stuart is one very fine artist specializing in Titanic and Liner pictures. Check out his work and buy the prints. US CITIZENSHIP INFO: Titanic page. MORE LINKS further down page. (I think they have the picture that`s further down this page.). Email me if you have a link for me to include in list. The (real) man talks about watching the ship sink from a lifeboat. click to become a member of my "Update" mailing list. Sorry there`s not more links but keep checking as I will be updating page regularly.